Everybody needs to make this amazing Champagne and Strawberries Cake at least once (and then you’ll want to make it again and again). It is such a moist and flavorful cake, and the combination of champagne and strawberries is perfect! The combination of strawberries and champagne is a classic favorite for special celebrations, anniversaries, Valentine’s Day, and more. I have to say that in cake form, it is even better! This isn’t the first time that we’ve created a recipe with champagne cake layers. 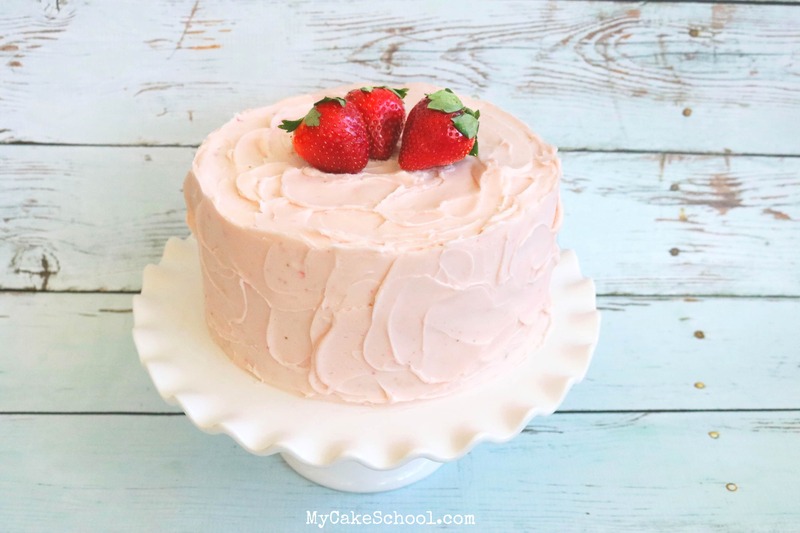 We have a couple of delicious Pink Champagne Cakes in our recipes section (a scratch pink champagne cake as well as a doctored cake mix version), which have been favorites of ours for special occasions, but this strawberry-champagne cake recipe is guaranteed to bring rave reviews! Valentine’s Day was on our minds when we decided on this Champagne and Strawberries cake recipe, but it would also be perfect for so many other occasions including engagement parties, New Year’s Eve, 21st birthdays, or any time when a celebration calls for something a little more sophisticated and special. 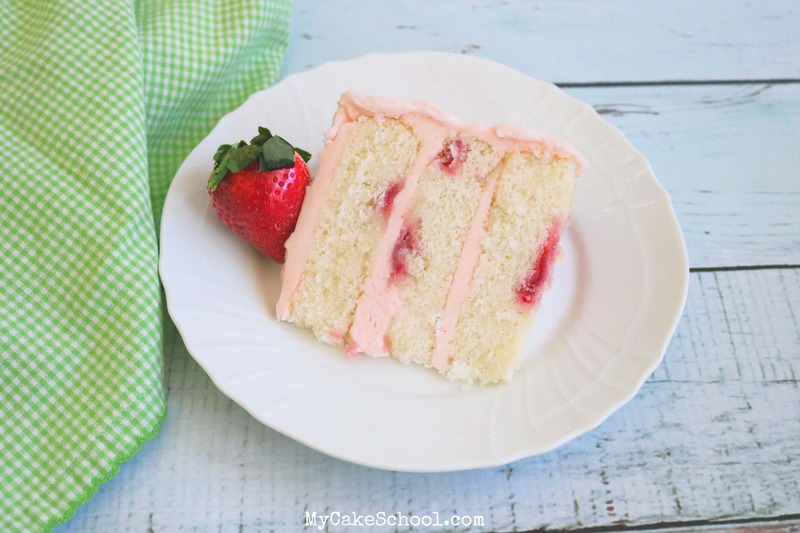 While this recipe is similar in some ways to our scratch Pink Champagne Cake recipe, this time we are using plain Champagne in the batter as well small bits of sliced strawberries and strawberry extract. To bring in even more champagne flavor, we’ve also lightly infused the finished layers with a delicious champagne simple syrup. After baking the cake layers, I poked the top of the cake layers with a thin stir straw. This will help our champagne syrup soak into the cake. Next, I brushed my cake layers with a simple champagne syrup. Although we have champagne baked into the cake layers, this syrup gives us an additional layer of flavor. 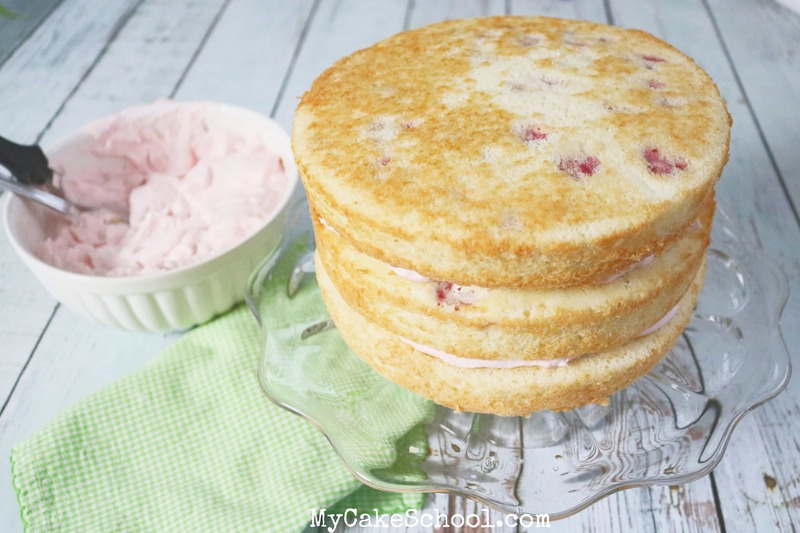 I filled the cake layers with a light and luscious whipped strawberry cream cheese filling. This recipe is going to be a new go-to for us when we need a light and flavorful strawberry filling! If you love whipped cream fillings and you love cream cheese fillings, this recipe is for you. It has a light consistency that is a bit thicker than the usual whipped filling, giving us the best of both worlds- and the flavor is oh so good! 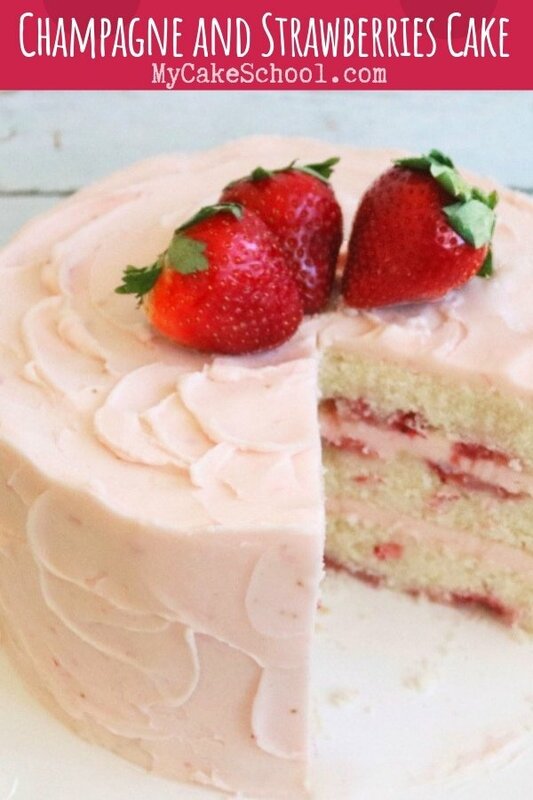 Since this is a soft strawberry filling, it’s a good idea to first pipe a dam of buttercream about 1/4 to 1/2 inch within the edges of the cake layers and then fill with the strawberry cream. 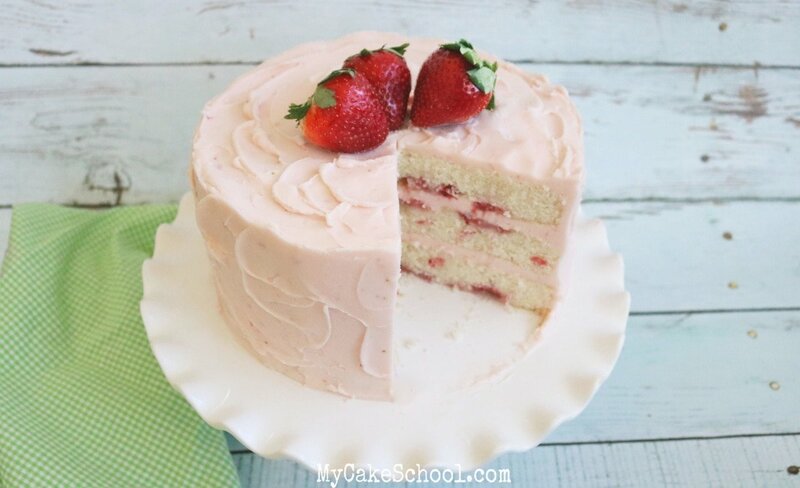 We frosted our cake with an easy and delicious Strawberries and Champagne Buttercream. This Strawberry Champagne buttercream recipe is similar in many ways to our classic strawberry buttercream, but we’ve replaced some of the strawberry puree with champagne. There is just a hint of champagne flavor in this buttercream, as the strawberry flavor is more pronounced. However when combined with the champagne flavor of the cake layers and simple syrup, everything is perfectly balanced! I used my offset spatula to give the frosting a little texture as I applied it. I love this pretty shade of pink! Although we don’t have any piped buttercream details with this design, the consistency of this strawberry champagne buttercream would be perfect for piping. And after slicing! 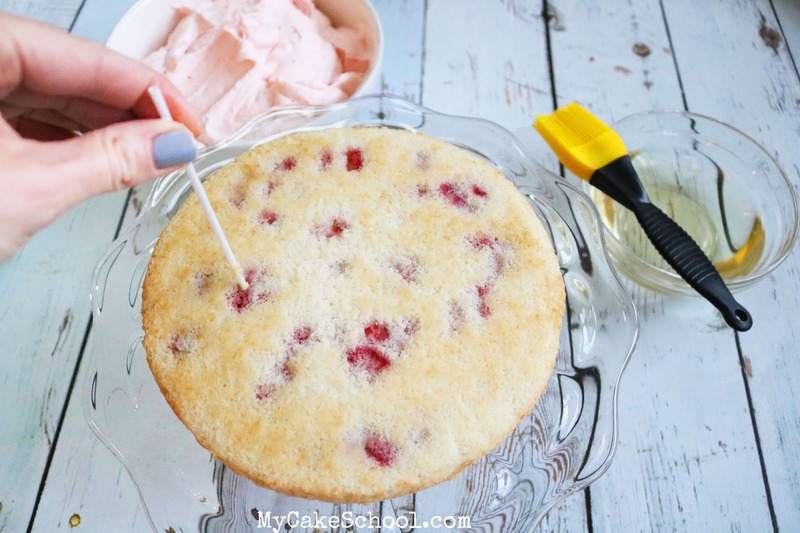 If your strawberry bits sink to the bottom of the cake, it’s okay! Most of mine did too…but the extra flavor is totally worth it- and it’s such a pretty slice! Piña Colada Cake A fantastic flavor combination of pineapple, coconut, and a hint of rum! Pink Champagne CakeThis has been a really popular recipe for us- if you love today’s recipe, you’re going to love this Pink Champagne Cake recipe too (and Pink Champagne Buttercream)! This sophisticated Champagne and Strawberries Cake is amazingly moist and flavorful! In another bowl combine the egg whites, champagne, vanilla, strawberry extract, and vegetable oil. Whisk until blended and set aside. In the bowl of your mixer, cream the butter and sugar 3 to 5 minutes. When it is light and fluffy add approximately 1/3 of the dry ingredients and mix until blended. Then add 1/2 of the liquid ingredients mixing until blended. Continue alternating dry and wet ingredients. Begin and end with dry ingredients (3 additions of dry and 2 wet). *Makes 7 1/2 cups of batter. Pour into prepared pans and sprinkle finely chopped strawberries over the batter, trying to avoid clumping the strawberries together. Bake 25 to 30 minutes. The cake is done when a toothpick inserted the center comes out clean. Cool in baking pans 10 min. then turn out. In a small saucepan add the sugar and champagne. Over medium heat, cook until the sugar dissolves, stirring constantly until the mixture is clear. Remove from the heat and cool completely before using. It can be stored in the refrigerator approximately 2 weeks. Use sparingly on your cake layers. Using a toothpick or skewer, make a few holes on the top of each cake layer. Remember that using too much syrup can cause the cake to become soggy. 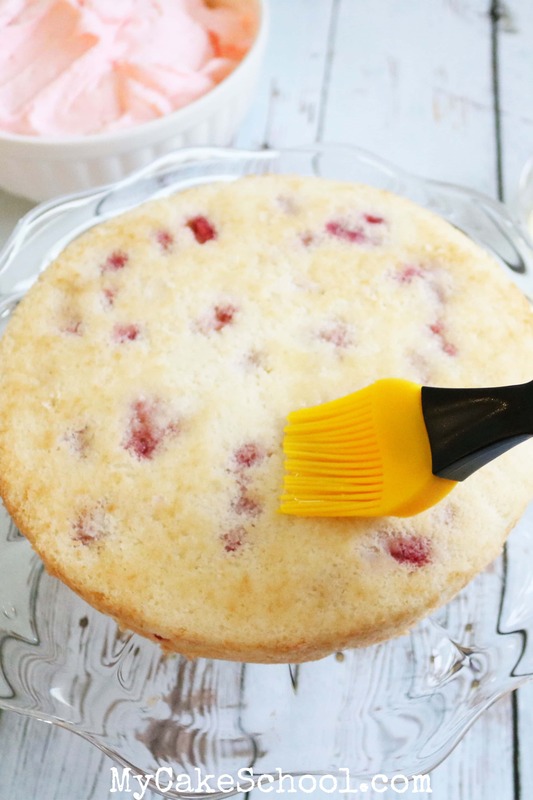 Using a pastry brush, brush the simple syrup on top of each cake layer. Now you are ready to fill and frost your cake. Chill the whisk attachment or beaters of a handheld mixer in the freezer for about 10 minutes. In a medium sized bowl, add the cream cheese, powdered sugar, strawberry puree and strawberry extract. Mix until blended. Slowly add the heavy cream and beat until fluffy- this will take about 2 minutes. This is a soft filling and so you'll want to pipe a dam of frosting about 1/2 inch from the edge of the cake layers, then spread filling within the dam. Makes about 3 cups. In the bowl of your mixer, cream the softened butter until smooth. Blend in strawberry extract. Gradually add the powdered sugar along with the champagne and strawberries until the powdered sugar is incorporated. Beat at medium speed 3 to 4 minutes. The texture will become very smooth. If you are tinting the entire batch of buttercream light pink, you can add a very small amount of coloring gel while it is mixing. If the buttercream is too thin add more powdered sugar. Thanks for stopping by! If you are interested in learning more about cake decorating, make sure to check out our Free Tutorials Section, which also includes a Free Cake Videos section! Looks and sounds delish! :-) Adding it to my ever growing list LOL! Thanks ladies for all the great recipes. Could we make this in a 9×13 cake pan and possibly split it into 2 layers or would they be too thin? Thank you! Cannot wait to try this one. Hi Priyanka, You could use a sparkling white grape juice instead of champagne. Welch’s is one brand, I’m sure there must be others. Hi Nancy, This recipe makes approximately 7 cups of batter and that would be the minimum number of cups for a 9×13 pan. I think once split the layers would be thin and possibly difficult to work with. I want to make this cake but what champagne do you use? Hi Veronica- The brand that we used was Andre, but any champagne will work nicely! Hi Marie, To be on the safe side, I would say not much over 1 hour. When a frosting or filling sits out too long it will taste fine, but it is not. I made this cake and followed it to a tee. It came out heavy and dense. What could have happen to make it this way. I thought it was suppose to be a light and fluffy cake. First I love your cakes. Every time I make one them I get rave reviews. I think it awful nice of me to share about 80% of my cakes with my neighbors. Ha, Ha. There is only my husband and myself to eat these wonderful cakes. If I didn’t share I would probably be a 100 pound over weight. Besides I love seeing their faces when I bring over one of delicious cakes. Ok, for the questions. I just celebrated my 75th birthday and would love to make this cake. Question 1, can I freeze this cake? Question 2, I need to make this 9 inches round instead of 3 8 inch cakes. Question 3 how much batter in each pan and how long do I bake if for? Because of the tacky decoration I want to put on it, I need a 9 inch cake. If it turns out okay I will send you a picture of my garish cake. Hi, love to try Champagne and Strawberries doctored cake recipe? However, I can’t find one. I saw the strawberry one. Hi Peggy, we don’t have an official Champagne and Strawberries doctored cake mix recipe but you could use our doctored cake mix Pink Champagne Cake recipe for the cake layers and do everything else the same.